Looks Good from the Back: We Discuss: Blog Resolutions. M: Okay, I wasn’t ready to declare this at the beginning of the year, but I’m ready now. M: I am giving up fast fashion for 2019. M: It’s good to have goals. M: It’s going to be HARD. M: However I stuck to giving up Everlane last year. A: That was not actually hard for you, though. A: Giving up fast fashion is something I’ve been thinking about too! M: I just sent a ton of Target stuff to the thrift store. A: All the thrifting I’ve been doing lately has really done a number on me. It’s a SEA of garbage from Old Navy, Target, and Walmart. M: And I am tired of this cycle. I find things I love for a minute, I wear them once or twice, wash, and then they are ruined. Literally disposable clothing. M: And yes the thrift stores are just CHOKED with it all. It makes me feel gross. A: It’s really a depressing cycle. I will say, though, I do sincerely love that Target denim jacket. M: It’s an exception though. You can find winners! I wear my two pairs of Moto pants literally every week. 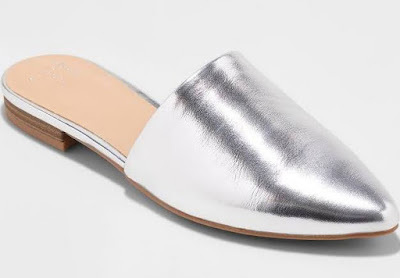 M: And those silver mules I bought last year! I love those things! M: But for every denim jacket or moto pant there are a dozen things that shrunk weirdly or unraveled. M: Oh no that is wrong. A: So we maybe need to decide what counts as fast fashion. M: Okay yes I think this is a good idea! M: Target and Old Navy for sure. A: I won’t even link to that store. M: And H&M, though that pains me and will be the hardest for me to give up. A: H&M is definitely fast fashion. M: I know you don’t like H&M but a have several things I love that have held up well. M: Ooh Loft is tricky but I am inclined to include it, even though I do think the quality is better. A: Loft is my go-to for summer dresses. M: Oh man this is getting harder now that I’m listing it all out. M: Maybe I’ll try to find stuff on Poshmark and that’s okay? A: That is totally okay! A: I will vow to not buy any clothing this year from: Target, H&M, Forever 21 and Old Navy. M: Maybe we give ourselves one get out of jail free card. A: But buying these brands secondhand is fine. M: We can do this! M: And I think we should keep ourselves accountable and share things we were tempted by but didn’t buy. M: I am going to really try and just NOT LOOK though. But it will find me. A: I am making no promises with Loft but I don’t know what the line is for fast fashion. A: Like, I don’t think Madewell counts. M: No, I don’t think Madewell counts either. A: I don’t buy Amazon clothing so I don’t know. M: I don’t either really. M: And I feel like it goes without saying no Walmart or whatever but I don’t shop there either. A: I don’t shop at Walmart either. M: We can do this. A: It looks like the biggest fast fashion brands (according to the internets) are: F21, Zara, TopShop, UNIQLO, Gap/Old Navy. A: I do really love my little UNIQLO jacket but next winter I’ll probably buy a nice version of it from a better brand. A: I don’t think most of this will be hard, honestly. I’ve already been making a shift away from a lot of these brands (and I already don’t buy anything from quite a few of them) but Target will be hard. M: Yeah I don’t think it will be that bad. Summer might be a challenge because that’s when I’m more likely to want cheap and cheerful stuff. A: Oh, definitely. Most of my quality purchases are in the fall. M: Same. And by February I’m so not interested in buying any more winter stuff. A: By February I want to burn all my winter stuff. A: In a big stupid bonfire. M: That sounds warm at least. A: It was gotdamn 14 degrees this morning. A: But, when it’s eleventy billion degrees outside and Universal Thread comes out with a bunch of cute summer dresses we’re going to help each other through it, yes? A: WE CAN DO EET. M: BTW this does NOT apply to housewares from Target because no. M: Not while I’m decorating a new house. A: Oh, I didn’t think it did! That would be insane. M: Plus I need like 11 more candles. A: The one that smells like the Anthro Volcano candle? I might need it too. A: Yep, gonna need that. A: Also, we are basically incorrigible. I really love this idea. I did a wardrobe clean out and was really furious at myself looking at all the crap I've bought. I'm on the fence about Loft too because some of my favorite dresses are from there, and I'm Petite and there aren't a ton of stores that carry Petites. Honestly I'm not sure Loft qualifies, and the petite thing sounds like good justification! I've found myself buying a lot less of this stuff, too, not really on purpose--but I can't give up workout clothes from Gap or Old Navy. I refuse to pay a lot for things I'm just going to sweat in, and it's much better quality than similarly priced items. Jump on! We differ a little in that I'd rather pay more for the things I sweat in because I want them to PERFORM. Gap workout stuff is decent quality but i've never had luck with Old Navy. I was back and forth on the Gap because I agree, it's not tragically crap like F21. I definitely think Old Navy qualifies though. i need a good fashion detox as well. i've basically given up on old navy and gap (although both are awesome for kids gifts)... but for myself, the biggest one i need to keep in check is J.Crew. they do have some amazing pieces but also a lot of crap. i need to be pickier about that. I bought a silk shirt from J Crew final sale two weeks ago. It came and it looked like polyester: thin, shiny, and cheap looking. I wore it two days ago, placed a mildly hot bowl of oatmeal on my lap and it scorched the shirt. I only paid $19, but it was originally priced at $110. I'm taking a long break from them. J Crew seems to be going through some leadership changes and it sounds like the brand is struggling. All these 70% off sales are not normal. I'll be curious to see what happens. And here I was contemplating another Gap order last night... Not sure I can give them up, there are a number of staples in my wardrobe that have come from there and I've shopped ON enough that I know what works for me from them. I'm just going to continue to work at being more thoughtful about my purchases and not just buy something because it's kinda cute and on sale. That said, do either of you have recs for basic Vneck Tees that work for someone with hips? I don't like how so many of them pull at that point, would like to see a drapey fit, and not so thin I need a cami under. Any thoughts? We aren't asking you guys to give anything up! Just setting our own dumb goals. As for the tees, have you tried Everlane? We both love their cotton v-neck tees. Totally get that! Just giving the idea some thought as well. :) I will look at Everlane. I think this is great! I gave up Target, Loft and Gap two years ago after a similar wardrobe purge. I realized everything (EVERYTHING!) in my donate bags were from those brands. I've never looked back. I breeze right by the clothing section at Target, and just don't go into Gap or Loft anymore. Done! Easy peasy, and the money I save I put towards more quality clothing that I know I will love for years. By the way, in regard to Loft.... I think they are on the cusp of fast fashion, for sure. I gave up on the brand because the quality is iffy, and the fit is just kind of tragic on me. But also... I tend to give the side-eye to brands that constantly mark down their entire inventory by 40%. It tells me that "full price" is a farce, and the quality/production of the clothes is only worth 40% of the original price. And they are still turning a big profit on that discounted price! J Crew, I'm looking sideways at you ,too. Plus as a thrifter, when I am in the LOFT sale section, I can point to a blouse and say, "I'll see YOU in six months at Goodwill for $4." I cannot give up on my Old Navy jeans. I have five pairs in rotation and will wear them every single day for a year or more before replacing. I had a terrible experience with J. Crew years ago and never went back. I oddly dropped $150 at American Eagle 3 weeks ago and I am 37! Still confused by that but I found cute jeans that fit and I didn't look stupid. Thankfully my 14 year old daughter is a total vintage junky right now so we are not buying and fast fashion for her. WHEW. Thrifting totally satisfies that summertime fast fashion itch! My summer wardrobe is mostly secondhand, from J Jill linen dresses (there's actually...a lot of linen) to crappy lacy Old Navy tops that will only be worn for a few months. I have the most luck at the thrifts with two things: high-quality sweaters and summer stuff. This is great! This year I’m trying to encourage myself to buy better quality and only what I need by only buying 12 new things this year (clothes, shoes and handbags). Second hand is allowed, underwear doesn’t count towards my total. I’m looking forward to the challenge!